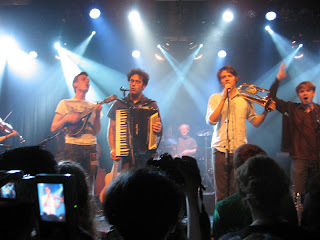 I absolutely LOVE Beirut, and love their use of the accordion in their music. I can play many of their songs on my accordion, and was so excited to be able to see them live, and to have my wonderful friend Gillian as my date. 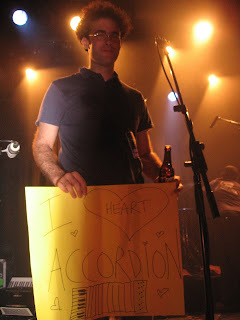 I originally was going to make a sign that said something along the lines of "I play the accordion and want to play with you" something like that. When the time arrived to go to the show, I decided I didn't want to do that so I made a sign that would show my appreciation instead. I think its more from the heart this way. 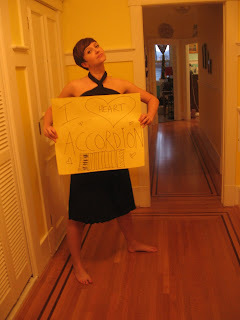 So I held up my sign, several times, and probably embarrassed the accordionist in Beirut. Holding this sign really did create a sense of community amongst Gillian, myself, and other audience members. People were curious to know what my sign said, and seemed delighted when I told them. I stood almost front and very centred as they played their hearts out, so much talent was on that stage at the Commodore Ballroom. Each musician having the ability to perform many different instruments. What a treat to have them blast out 3 encores as well!!! So the end of the show had to come, and I told Gillian that I wanted to leave my sign on the stage for the accordionist to keep. As I made my way up to the front he came out to collect instruments I suppose and I handed him my sign and he bashfully took it and we had a brief exchange of "thank you's" to eachother. I snapped this shot of him, and heard a little cheer from other audience members as I did this.